Forestry | Burnaby Bag & Burlap Ltd. There are several uses for our products in the forestry industry. 1. Natural burlap on large rolls is used to cover mostly raw lumber and comes 48″ or 54″ in 250 yard rolls. 2. Laminate is a combination of natural burlap on one side and kraft paper on the other used on top quality high end green lumber. Available in 48″ or 54″ on 1,000 feet rolls. 3. Lumber shield is a type of woven poly, black on one side and white on the other, used to cover kiln dried lumber. 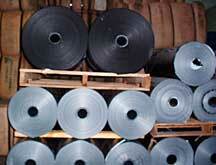 Available 48″, 54″ and 96″ widths on 1,000 yard rolls. Burlap cone bags are used for cone seed collection. The green cones are picked and bagged, and allowed to ripen in the bag until the seeds fall out. They have a 40 liter measuring capacity and are available in 7 oz or 10 oz material depending on the seed being collected.